A new blog award has appeared! 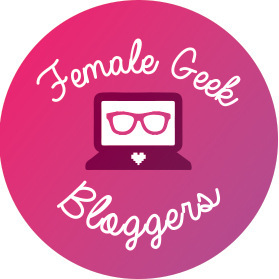 I feel incredibly lucky that Michelle of A Geek Girl’s Guide nominated me for her award: the Achievement Unlocked Award. Her kind words warmed my heart so I am so excited to take part in this award that she has so carefully crafted for our blogging niche. If you haven’t seen Michelle around before, she is not only writes amazing blog posts like this article on games that help you destress, but she also runs an amazing Facebook group called Geek Blogs Unite. Michelle is a super talented blogger and has many ongoing blog series but First Look is probably my favorite! You can check out those right here. Tags are so much fun to do! I was thrilled when I got tagged for The Game Tag by Kim and Aaron of Chimmyville. Thanks so much Kim! I’m a bit new to following Chimmyville, but you should definitely check out The Buffy Tag and Sightseeing in Bristol! There’s tons of lifestyle, food, and travel posts so be sure to follow Chimmyville so you don’t miss a post! I haven’t seen this one making the rounds on WordPress, and that’s probably because it originates on DeviantArt. Credit for the questions go to Leminz. This tag will be set up as close as possible to my other tags so please bear with me as there is an absence of rules (which is a nice change of pace). In the spirit of a tag without rules, I’m going to do some quick-fire responses and tag five blogs at the end! Let’s do this. I can’t… Or I won’t. I think I can breathe. Just hold me, for tonight? You are such a relief. When was I held like this last? I thought the world was ending. Maybe it’s just the beginning. This poem is a part of a series. See the Prelude and Part One here. Thanks for reading. Welcome to my very first Geek Chic Lookbook! These lookbooks are to show you how to take your favorite geeky and fandom-inspired clothing and incorporate them into your every day wardrobe. This month’s lookbook features one of my favorite graphic tees by Adorned by Chi as our centerpiece in five outfits. If you want to get your own “Pretty Girls Like Anime” tee, you can use my discount code AGEEKYGAL at check out (affiliate link)! For more details on each outfit, make sure to open the description box! This week’s YouTube video was voted on by my Twitter followers! Make sure you follow me on Twitter so you don’t miss out on the next opportunity to vote on my YouTube videos! Without further ado, check out these five geek chic outfits! Here’s part one of Divinity: Original Sin 2! Welcome to my March 2019 recap! March was quite an eventful month with THREE YouTube videos that went up! I had to add a new category just for these videos that I am so proud of. Have you watched my interview with Rebeccah of Hartline Art yet? It’s amazing! I loved filming it… With the first week of April upon us, let’s take a look at the month of March here on A Geeky Gal!